There are very few Thoth-based decks around, and most of them are of the darker brooding kind, this deck is the complete opposite of that! Yes it has darker images, yes there are disturbing looking ones (but then what deck that has a equilibrated structure hasn't? ), but that's not all there are light ones luminously looking some even with a happy feel to them. But above all it's an deck with an highly elegant look, elegant figures and that leave a deep impression when looking at them. 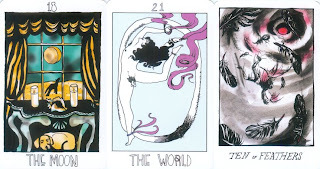 The artist has put lots of thought and feeling into the deck, creating at the same time a work of art and a true tarot deck. Based upon & following the structure of the Thoth tarot yet not slavishly following it rather reinterpreting it viewing it through her own eyes this is a nice deck to add to your collection. There are decks for every taste, there are decks for every mood even, and this one is definitely for those who can take life with a smile and who need or want to put that smile into their tarot collection (and or readings even). 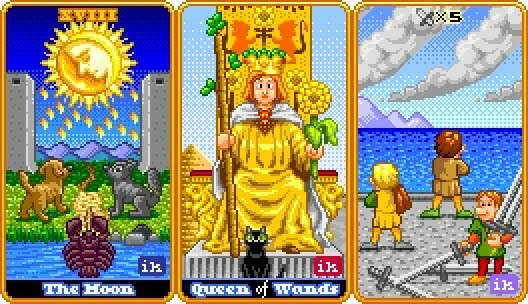 It’s a Wait-Coleman remake with may be specially interesting for those among us who remember the arcade games from back in the 80ies and their distinct graphical depiction, bet even those who don’t or had no interest in those may enjoy this deck! The images are rendered in the rounded-pixilated style typical to those videogames mentioned and breathe a fun lighthearted atmosphere. During the creation process the artist released on a (more-or-less)-regular parts of the deck, 6 packs in all containing between them all 78 cards. Some decks stay under my radar and escape me - or at least for some time, the first limited edition of 500 decks published in 2008 escaped me completely the second one of 750 published end 2009 did not! Despite it's not hugely original name this deck is original and worthy to get into the collection of all who are looking for something different. 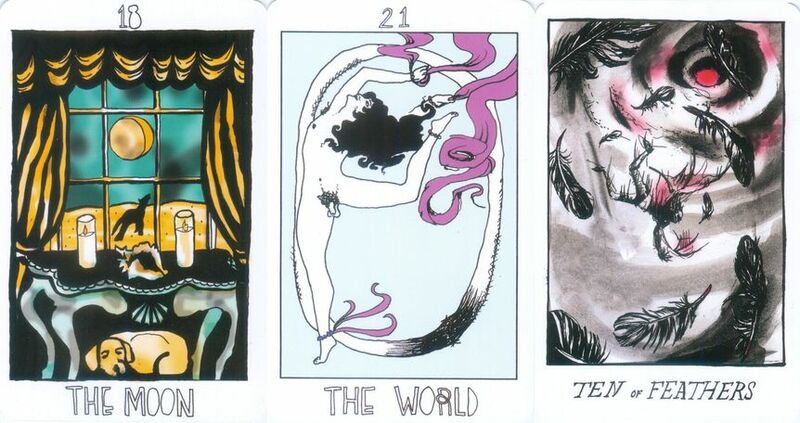 When you encounter a deck that descibes itself as: "queer-centric, radical-politicked tarot deck re-imaged to fit our times"you can not resist it (well at least i could not). There where over 20 persons involved but despite that the deck has a great consisty and is well worked out in structure and system. 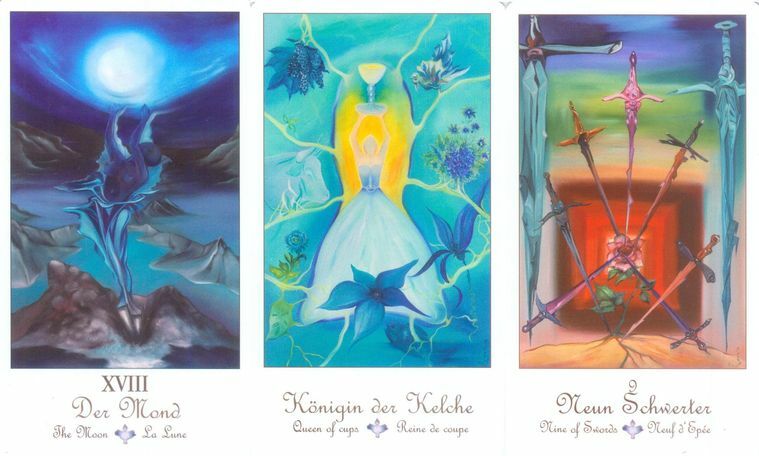 Reworked updated, modernisized and with much renaming into the deck it is different yet remaining true to tarot structures. 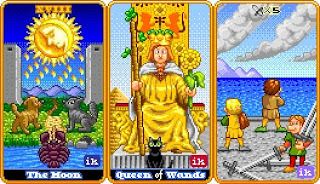 The suits are found magical objects: Keys (wands), Bottles (Cups), Feathers (Swords) & Bones (Coins) the court cards are fase cards are non hierchical system, stages of growth: seeker, apprentice, artist & mentor. If you're interested in it you can buy one at Eberhardt Press. 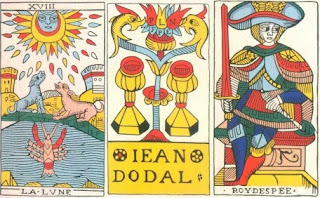 Tarot forums are a real goldmine for information from and by truly passionate persons, one of those is Pablo Robledo who uses the handle “eltarot78” and has a wonderful longstanding love affair with the Dodal tarot (one of the decks considered as one of the foundations of the Tarot de Marseille family tree). Mister Robledo has spent many hours of hard work restoring the original images we have of the deck to its true glory and one can feel the passion he poured into even at first glance! I had now my first 48h with my Dodal now and still am very impressed with it. The material feels great also, not flimsy or thick and with a wonderful silky feel to the touch - a pure joy to handle. Something making this extra special (and even extra-ordinary for the collector) is the very small size of this edition, only 8 decks have been created. This deck is a true pearl within the Marseilles section of my collection!